I want to start this post off by giving a big shout-out to Councilman Harry Lashley and State Senator Michael Hough. Based on the results of the PIA request I sent to Brunswick, they are big fans of A Miner Detail and Thor at Four. Thanks for reading guys! 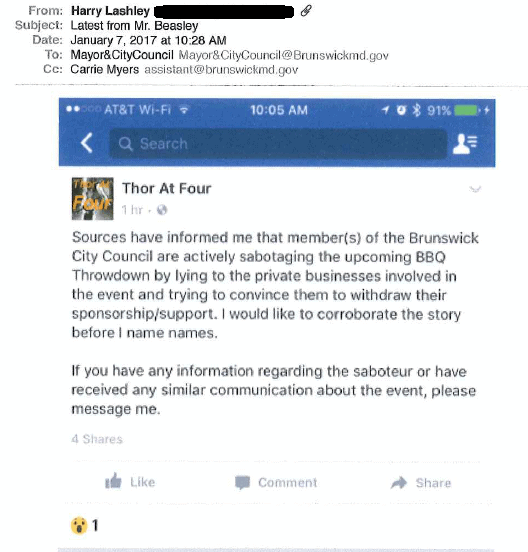 I mentioned last week that I had filed a PIA request for communication to and from Brunswick City Council regarding the Great BBQ Throwdown. Instead of a sandwich, I received a filet mignon with lobster tail. It appears that Councilmember Lashley is an avid listener of my radio show. So much so that he receives e-mail notifications for every Facebook post. Again, thanks for listening. 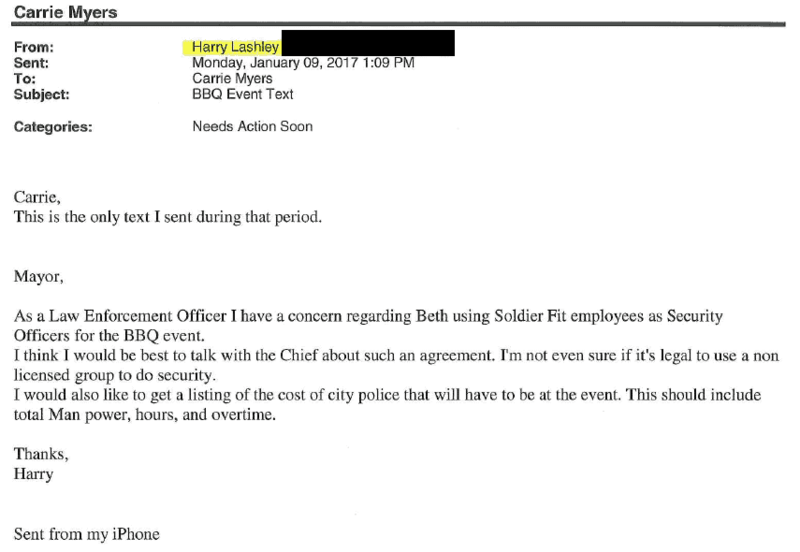 Also from Councilman Lashley is a text (looks more like an e-mail to me) in which Lashley reiterates a previously discussed lie about the Great BBQ Throwdown. At no point was SoldierFIT involved with providing security or volunteering at the event. The above e-mail lends further credence to the dishonest manner in which the Brunswick City Council was debating this event. First, big thanks to our fan Senator Michael Hough for following our blog and Thor at Four so closely. However, as readers and listeners know, it was Angel White that attempted to sabotage the Great BBQ Throwdown. These messages display the political alliance between Councilman Ripley and Senator Hough. Instead of “Hough-Funded”, perhaps “Hough-mentored” is a better term? Above is a Facebook conversation between Councilman Ripley and Beth Johnson (Event Organizer). As you can see, Councilman Ripley was made aware of Councilmember Angel White’s actions on January 7th at 9:48 am. Which makes this message even stranger…. The message contents are not necessarily important. Personally, I enjoy my life very much. I’ve got an amazing wife, two wonderful boys, and a successful career. However, I am not a big fan of government incompetence. What is important is that 13 hours after being informed that Councilwoman Angel White was trying to sabotage the Great BBQ Throwdown, Ripley decides to not complain about the saboteur, but complain about the whistle-blower (pun intended, for everyone that knows the BBQ will be setting a Guiness World Record for most train whistles blown at the same time). This attitude, along with the Council’s conduct behind closed doors, merely proves the need for a responsive, informed, and active eye on their actions. While it is obvious by now that I am the one who requested the information, this response rubs me the wrong way. The entire point of a PIA request is for information to be made available to the public, to be able to see how the government is conducting their duties. Why Dr. Allgaier is asking for such information is a answer the reader should decide on their own. UPDATE: I should go ahead and explicitly state this. My PIA request was for all 6 members of council during a time period of communication related to the Great Brunswick BBQ Throwdown. Neither Councilman Tom Smith or Carroll Jones had any questionable communication under the parameters of the PIA request. Councilman Smith did not send or receive any communication related to the BBQ and the only correspondence received by Carroll Jones was the Railroad Days vendor agreement, to be modified for the BBQ.